Bayern v Fortuna Düsseldorf produced another massive upset inside the Allianz Arena. Bayern were up 2-0 and 3-1 but still dropped two points as Dodi Lukebakio scored a famous hat-trick that helped Fortuna to secure a valuable point. Bayern drop points in Munich again. Thomas Müller two goals not enough to secure Bayern the win. Dodi Lukebakio scores a famous hattrick. Bayern started aggressive rushing forward with all players straight from kickoff that in turn, however, gave Fortuna room to counter and Dodi Lukebakio tested Manuel Neuer in the 1′ minute, who had to give up a corner from the shot. That chance gave the underdogs some confidence as Takashi Usami tested Neuer straight after the corner in the 2′ minute. A pattern emerged from the energetic start by Düsseldorf. Bayern would try to push Fortuna deep into their defensive third, but Düsseldorf seemed comfortable with that setup as they always were on the lookout for a quick counter whenever they won the ball. Nonetheless, it was the Bavarian giants that would take the lead in the 17′ minute. Having won a corner Düsseldorf struggled to get the ball away, and the ball landed at Nicklas Süle‘s feet, and the defender scored with a shot from 11-yards out. That goal opened the tin can because in the 20’ minute Jérôme Boateng played a great ball inside the box to Thomas Müller, who had escaped his defender, and the forward tapped the ball past Fortuna keeper Michael Rensing to make it 2-0. Experience football in Germany live! Book your European football travel now by visiting Nickes.com! In a matter of three minutes, Bayern had undone a hapless Fortuna side. But the Bavarians did not follow up instead they tried to slow down the game passing around the ball. For 25 minutes it was the usual trot at the Allianz Arena until, well until Bayern invited Fortuna to score. Matthias Zimmermann played a wonderful pass to Jean Zimmer inside the box, Boateng only halfheartedly challenged the winger, who managed to pick up Lukebakio inside the six-yard box and the striker managed to beat Neuer to give Düsseldorf a lifeline. Ahead of the match Friedhelm Funkel said: “it is easy to forget that Bayern are still a world-class team.” For the first 12 minutes of the second half, Bayern did plenty to remind people of that fact as they completely dominated Fortuna Düsseldorf. With that dominance it was only a matter of time for Bayern to score and in the 57′ minute, Müller had his second with a wonderful low-curled effort from just outside the box. Bayern’s defensive sloppiness, however, was always threatening to allow Fortuna to get back into this match. Lukebakio caused mayhem in the 60′ minute with Bayern defence struggling to clear the ball, in the 66′ minute Oliver Fink’s header missed the goal by just a fraction and in the 69′ minute defender Robin Bormuth missed a freekick cross inside the five-yard box by just a few inches. It was only a matter of time until Bayern would give up that second and the goal arrived in the 78′ minute. Boateng was caught in no man’s land just inside Düsseldorf’s half allowing Lukebakio to break loose and after a 45 metre sprint the Belgian did well calmly slotting the ball past Neuer – the goal was then reviewed for a potential offside but the video review showed that he was onside showing once again the value of the VAR system. The goal opened up the game, and both sides were now looking for that sixth goal that would settle it one way or another. In the 89′ minute, it appeared that Bayern had it, but Robert Lewandowski missed the wide-open net from just a few yards out. Instead, it was Düsseldorf that would write history. Rouwen Hennings won the ball deep in his half and released Lukebakio once again. The Belgian broke free, easily shaking off Süle, and then beating Neuer to make it 3-3. The goal capped off an epic collapse by Bayern, who lost complete control after their third goal of the game inviting Düsseldorf to produce a comeback that fans inside the Allianz Arena have not experienced since the Jürgen Klinsmann era almost ten years ago. “I feel very good and I only want to thank my coach and my teammates for this”, Dodi Lukebakio said after the match. “We always believed because our team has a strong mentality,” he added. Lukebakio without a doubt was the man of the match. His pace caused countless problems for Bayern’s defence, who were never able to contain the forward. Nominally, a winger it was a tactical masterstroke by Düsseldorf head coach Funkel to play Lukebakio as a centre-forward. Defensive sloppiness continues for Bayern. Once a bastion the Allianz Arena has now become a free for all for visiting Bundesliga sides. Bayern were up 2-0 and then 3-1 but could still not contain a second-rate Düsseldorf side. Lukebakio’s first goal was exemplary for Bayern’s problems. Boateng allowed Zimmer to cross the ball easily to the centre after making just a half-hearted block for the first cross. Meanwhile, Lukebakio had to much room in the middle to easily score. The second goal was also textbook on how not to defend. Bayern’s defence was caught inside Düsseldorf’s defence allowing Lukebakio to escape the backline to score his second. Kovac then reacted to bringing on Rafinha for Renato Sanches and Mats Hummels for Müller, but even with the additional defenders, Bayern could not preserve the lead. Fortuna Düsseldorf have not won against Bayern for over 27 years – the longest streak of any current Bundesliga side. Fortuna Düsseldorf remain the only Bundesliga side that Robert Lewandowski has never scored against. Thomas Müller scored his first goal from outside the box since March 2015 (4-0 in Bremen). 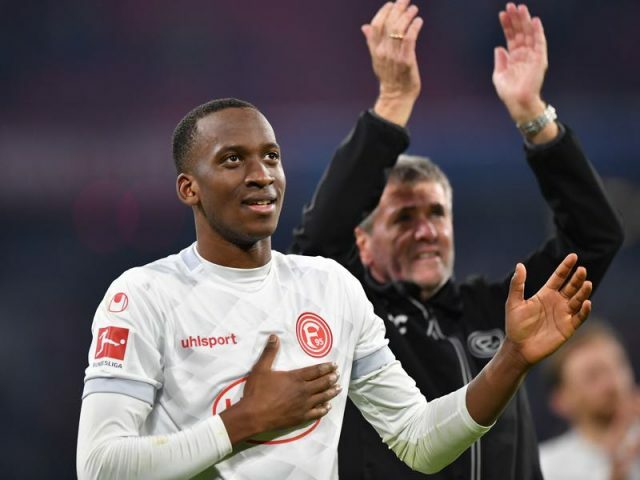 Dodi Lukebakio is the first player since Ebbe Sand (April 2001 for Schalke) to score a Bundesliga hattrick against Bayern.